Elite: Danderous 剛剛出了Chapter 4. 改了以往Explorer 的模式, 並加入了公會系統. 筆者剛開了一個叫RHKR ( Royal Hong Kong Regiment ) 的公會, 歡迎有玩的香港人加入. 個公會主要係做EXPLORER, TRADING, MINING及BOUNTY HUNTING. 目前主要活躍位置為星系 ADITI, 一個在BUBBLE邊緣的帝國星系走難努力生存中. ADITI 星系主要任務為PASSENGER TRANSPORT及DATA SCAN, 附近有不少豐富礦產星系. ADITI星系, 原本是升帝國RANKING的主要星系之一, 以前好多PILOT在此居住, 但在之前的改版後, RANKING升幅減少, 因此現在PILOT數目很少, OPENPLAY相對比較安全. ADITI亦係筆者出發到銀河中心的最後補給站. 因此主要大船大都泊在ADITI. 有傳公會系統日後可以買母艦, 而買母艦條件, 為附合GAME內某些日後設定的GOAL. 若是的話, 希望母艦可以為EXPLORER的PORT, 作遠距離星際探險的SAVE POINT. I’ve tried to incresae my Imperial rank to Duke to unlock the largest user ship, Imperial Cutter. Before the 2.4 update, I used to use the Wu Guinagi route to do the data delievery and planet scan takes to increase my rank. However, I was quite busy and counldn’t get the Duke rank before the 2.4 update. I was at rank Count. And the Wu Guinagi route had been changed after 2.4 and no longer have the data delievery mission any more. 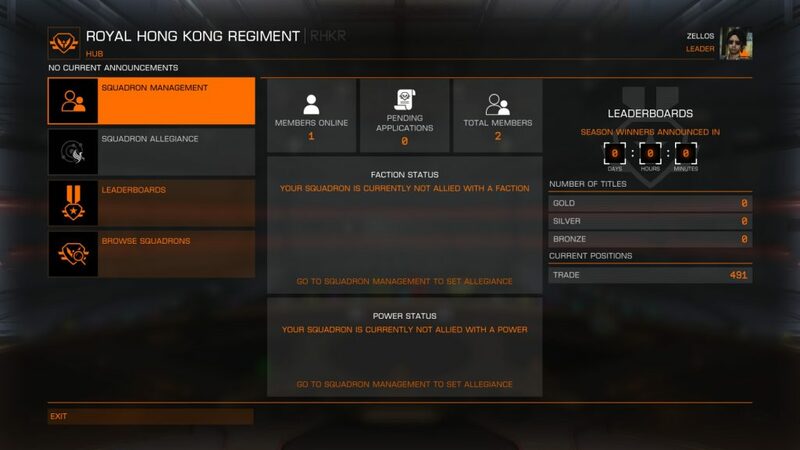 So I went to system Aditi to do passanger missions as I had a Beluga Liner. The Aditi route could increase the rank in a fast way and it is a short and profitable route. However, when I was at rank Marquis 70% to Duke, the auto docking had some problem and my ship crashed with a imperial vessel. It took me got a 7 day bounty of the Aditi systme. So, I was no longer to stay in the Aditi system to do the passenger missions. As other CMDRs said they were in the Cubeo system and doing data delievery missions, the I went to the Cubeo system. But it is harder than the Aditi route to increase the rank. But I made it today finally.